Not to be confused with Slugging. Babe Ruth holds the MLB career slugging percentage record (.690). Unlike batting average, slugging percentage gives more weight to extra-base hits such as doubles and home runs, relative to singles. Walks are specifically excluded from this calculation, as a plate appearance that ends in a walk is not counted as an at bat. The name is a misnomer, as the statistic is not a percentage but a scale of measure whose computed value is a number from 0 to 4. The statistic gives a double twice the value of a single, a triple three times the value, and a homerun four times. A slugging percentage is always expressed as a decimal to three decimal places, and is generally spoken as if multiplied by 1000. For example, a slugging percentage of .589 would be spoken as "five eighty nine." In 2016, the mean average SLG among all batters in Major League Baseball was .417. 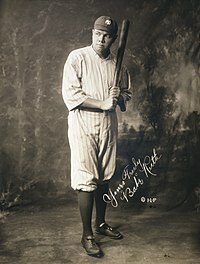 For example, in 1920, Babe Ruth played his first season for the New York Yankees. In 458 at bats, Ruth had 172 hits, comprising 73 singles, 36 doubles, 9 triples, and 54 home runs, which brings the total base count to (73 × 1) + (36 × 2) + (9 × 3) + (54 × 4) = 388. His total number of bases (388) divided by his total at-bats (458) is .847 which constitutes his slugging percentage for the season. This also set a record for Ruth which stood until 2001 when Barry Bonds achieved 411 bases in 476 at-bats bringing his slugging percentage to .863, which has been unmatched since. Long after it was first invented, slugging percentage gained new significance when baseball analysts realized that it combined with on-base percentage (OBP) to form a very good measure of a player's overall offensive production (in fact, OBP + SLG was originally referred to as "production" by baseball writer and statistician Bill James). A predecessor metric was developed by Branch Rickey in 1954. Rickey, in Life magazine, suggested that combining OBP with what he called "extra base power" (EBP) would give a better indicator of player performance than typical Triple Crown stats. EBP was a predecessor to slugging percentage. In 1984, Pete Palmer and John Thorn developed perhaps the most widespread means of combining slugging and on-base percentage: On-base plus slugging (OPS), which is a simple addition of the two values. Because it is easy to calculate, OPS has been used with increased frequency in recent years as a shorthand form to evaluate contributions as a batter. In a 2015 article, Bryan Grosnick made the point that "on base" and "slugging" may not be comparable enough to be simply added together. "On base" has a theoretical maximum of 1.000 whereas "slugging" has a theoretical maximum of 4.000. The actual numbers don't show as big a difference of course, with Grosnick listing .350 as a good "on base" and .430 as a good "slugging." He goes on to say that OPS has the advantages of simplicity and availability and further states, "you'll probably get it 75% right, at least." The maximum numerically possible slugging percentage is 4.000. A number of MLB players (117 through the end of the 2016 season) have momentarily had a 4.000 career slugging percentage by homering in their first major league at-bat. Hundreds of other players have momentarily held a 4.000 percentage for a season by hitting a home run in their first at-bat of the season. No player has ever retired with a 4.000 slugging percentage, but four players tripled in their only MLB at-bat and therefore share the record of a career slugging percentage of 3.000 (when evaluated without regard to a minimum number of games played or plate appearances). The players are Eric Cammack (2000 Mets), Scott Munninghoff (1980 Phillies), Eduardo Rodríguez (1973 Brewers), and Charlie Lindstrom (1958 White Sox). ^ "Career Leaders & Records for Slugging %". Baseball Reference. Retrieved 2014-02-27. ^ a b Baseball Scorekeeping: A Practical Guide to the Rules, Andres Wirkmaa, Jefferson, North Carolina, London: McFarland & Company, Inc., Publishers, 2003. ^ "Major League Total Stats » 2016 » Batters » Dashboard | FanGraphs Baseball". www.fangraphs.com. Retrieved 2017-04-30. ^ "Single-Season Leaders & Records for Slugging %". Baseball Reference. Retrieved 2016-12-10. ^ Lewis, Dan (2001-03-31). "Lies, Damn Lies, and RBIs". nationalreview.com. Archived from the original on 2012-10-20. Retrieved 2012-07-01. ^ Barra, Allen (2001-06-20). "The best season ever?". Salon.com. Retrieved 2007-07-15. ^ Separate but not quite equal: Why OPS is a "bad" statistic, Bryan Grosnick, Beyond the Box Score, Sept. 18, 2015. ^ Spector, Jesse (2010-05-29). "Ex-Met Eric Cammack is one of only four players to post career slugging percentage of 3.000". Daily News. New York.